In today’s fast-paced digital world, messaging and communication needs to be short and sweet. That’s even truer in a K-12 school with students who have attention spans trained for Facebook, Twitter and YouTube. Digital signs in schools can effectively provide students, parents, staff and visitors with up-to-date communication regarding school announcements, upcoming events, and important messages. Timely or Breaking News. Local and national news and weather don’t stop while students and teachers are in class. Many students want to be kept informed during the day and will be distracted by rumors or false reports they hear during the day. Digital signage picks up where traditional modes of communication leave off. In many cases, it complements existing forms of communication, such as digital notifications. Schools are finding new ways to use this unique medium every day, from changing the lunch menu in the cafeteria to broadcasting a system-wide emergency alert. Digital signs are eye-catching, easily changeable, environmentally friendly, and cost effective. Assembly spaces. In a gym assembly space, signage can do double duty as a scoreboard. As an accompaniment to assembly spaces, digital signs can maximize presentations, performances, and showcase important information to a captive audience. A very important benefit for schools is that sponsorship ads on digital signs in assembly spaces can generate revenue. Hallways and Locker Areas. Keep students informed and engaged as they pass between classes. Entrance Lobbies. A way-finding digital sign can direct visitors to the school office, destination room or other school facility. As a universal, versatile, and connected communication device, digital signage is an ideal investment for any educational facility. Consider implementing digital signs in your own facility to reduce environmental waste, maximize space and improve the administrative reach around campus. 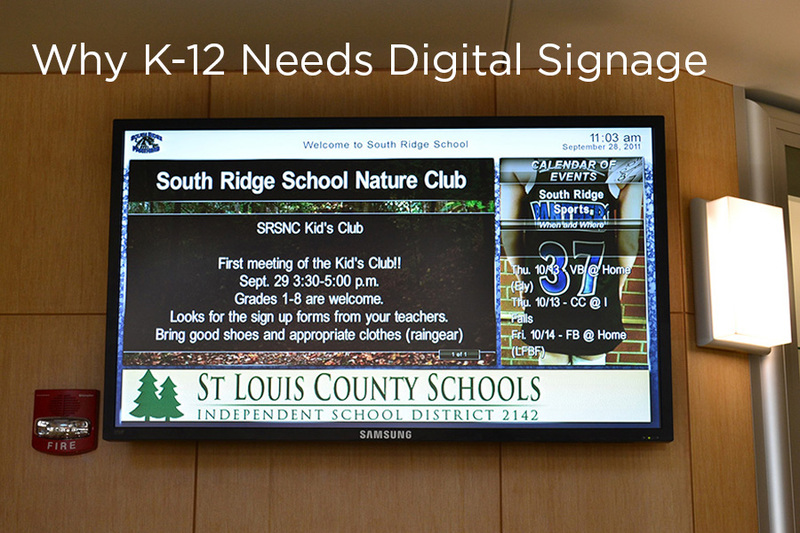 If you have questions about digital signage for your K-12 school or campus, please contact our K-12 Education Account Manager, and digital signage expert, Joe Thompson at joe.thompson@alphavideo.com and 952-841-3393 (o) or 612-644-6894 (m).